The Birks Cinema was fully operational until 1980 when after 43 years it showed its last film and closed in order to serve as an amusement arcade. The arcade then closed in 2004 and the attractive art deco landmark building lay derelict and unused and went on sale. In 2005 Charlotte Flower stood in a meeting in Aberfeldy and asked ‘Has anyone noticed the cinema is for sale?’. The Friends of Birks cinema then formed with the intention of carrying out renovations in order to bring the cinema back to life. This small dedicated team have finally achieved this after gaining support and carrying out fundraising events. 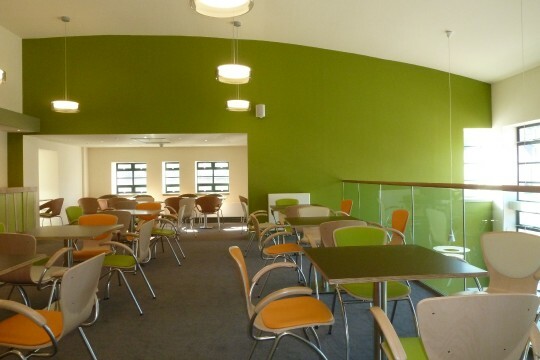 Charlotte Flower made contact with Café Reality to discuss the furniture requirements for the café and lounge areas which had to cater for up to 70 people. The furniture had to reflect the cinemas art deco period yet still be contemporary and comfortable for each user to sit comfortable to relax within the newly refurbished surroundings of the cinema. The Bingo chair was chosen for the majority of the seating as it has a generous beech shell and a sturdy yet elegant frame which is available in silver or chrome. The Bingo chair is also available with and without arms and comes with seat and back pads which adds extra comfort and in this instance colourful vinyls were chosen to compliment the interior scheme. A retro lounge style dining chair was also required and the Kirkos chair was selected as it has a unique shape and was covered in a detailed herringbone green fabric. The Somerset red leather sofas and complimentary red leather cubes were also specified to go within the lounge area as they are real leather, had the art deco look and have been recommended for commercial applications. The table tops were made as specials as they required a ply edge laminated in Durion Laminate with rounded corners which again reflected the art deco style of the time. We were happy to send laminate samples up to the cinema so they could see the many different ranges of Durion and Altofina Laminates available. 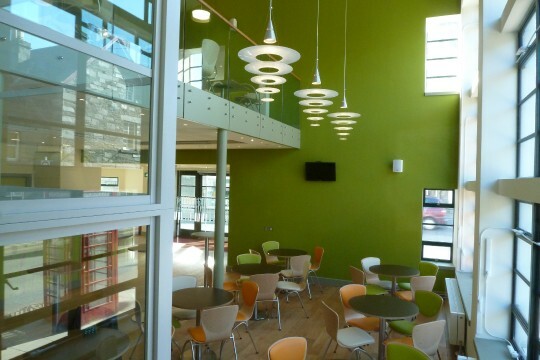 We really enjoyed collaborating with the Friend of Birks Cinema and they were really pleased with the furniture supplied. 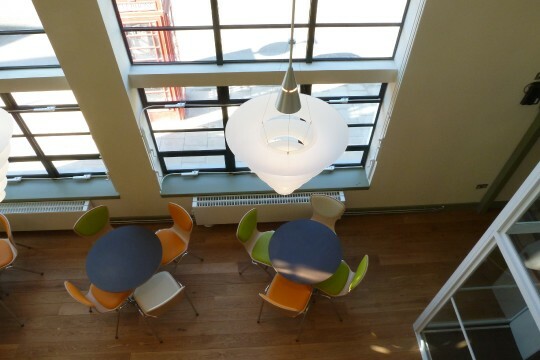 Here are the photo’s they kindly sent to us showcasing the furniture in situ.